” Popular local singing group the Mustard Seed Singers performed a highly enjoyable Festive Concert at St Mary’s Hall on the evening of Friday, 18 December. Under the direction of founder and director Elle Caldon, the Canterbury and Whitstable choirs united to perform a mixture of traditional carols sung to familiar tunes; well known ones to unfamiliar tunes; and one or two that were totally unknown to the audience. Early fears that the choir would outnumbered the audience proved to be unfounded as a late surge of people almost filled the hall. The concert began with a spirited performance of “Carol of the Bells” which demanded rapid vocal delivery whilst maintaining clarity of diction; no easy task but the singers accomplished it. “Away in a Manger” was the first example of a familiar carol being sung to an unfamiliar tune. the Carol lost nothing of its charm and gentleness and was well received. “Silver Bells” returned us to the Christmas bells theme but this was a gentle affair, conjuring up images of busy shoppers relaxing to the sound of the bells. “Gloria Hodie” by Emily Crocker, was unknown to the audience but they were won over by its bewitching charm. It was a joy to rehearse and increasing familiarity led to a strong, confident rendition by the choir. “Oh Little town of Bethlehem”sung to the most well known tune, gave two members of the choir the chance to perform short solos. Penny Kidson sang the first two lines of the first verse and John Rose sang the last two. The whole choir then sang the remainder of this delightful and so well known Carol. This brought the first half to a close and during the interval, mince pies and soft drinks were served to the audience by willing volunteers. The second half began with “May your Cup” in which several seasonal goodwill sentiments were expressed in unison and generated warm applause. “Silent Night” was another example of a familiar Carol being sung to an unfamiliar tune but once again it worked well. “Mary’s Boy Child” followed and many older members of the audience will have recalled Harry Belafonte’s moving interpretation in the late 1950s whilst a younger generation will have been more familiar with the Boney M version. Elle Caldon then sang “The Angel Gabriel”, a traditional Basque Carol translated into English by Sabine Baring-Gould, Anglican Priest and folklorist from Devon and composer of many hymns, the best known being “Onward Christian Soldiers”. With a gentle piano accompaniment by Marius Reklaitas, Elle’s clear, strong voice emphasised the magic and simple beauty of the Carol. The audience gave Elle a well deserved ovation. Dulcie Copeland and Jacqui Selby shared solos during the first verse of “Once in Royal David’s Royal City” then both choir and audience joined in the remaining verses. The concert ended with a resounding performance of “Ding Dong Merrily on High”. The concert raised an impressive £260 for group funds. Many thanks to everyone responsible for producing the programme, selling raffle tickets, producing and serving hordes of mince pies and soft drinks and for all the other tasks that ensured the evening’s success. Particular thanks to pianist Marius not only for his accompaniment during the concert but also for the hard work he puts in at regular rehearsals. Elle’s input is truly invaluable: put simply, without Elle’s inspired leadership and dedication, Mustard Seed Singers would not exist. Mustard Seed Singers rely on grants and donations to keep going so the total raised was much appreciated and highly valued. 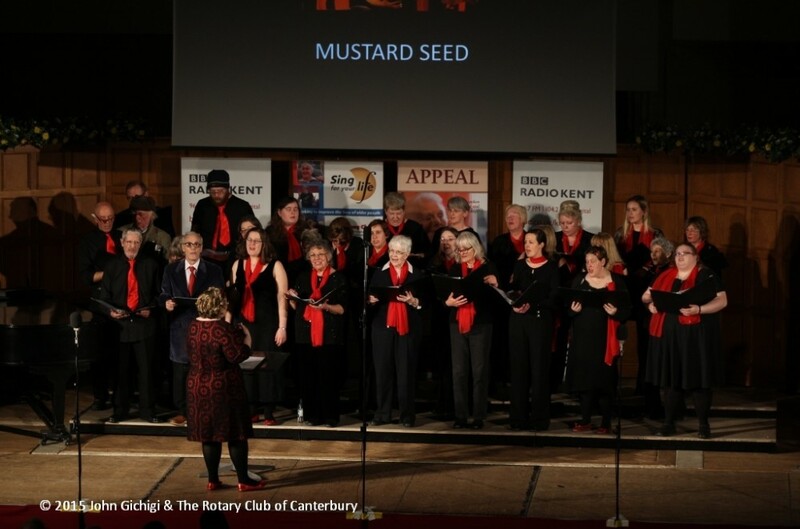 The Mustard Seed Singers charity comprises two choirs, one in Canterbury and the other in Whitstable. The singers in the groups fully believe that singing has a positive influence on mental health and wellbeing, an idea that has been supported by recent research (principally by Canterbury Christ Church University’s Sidney De Haan Research Centre for Arts and Health, based in Folkestone). After a well deserved break, the Canterbury group will resume on Thursday 7 January 2016 at All Saints Hall, Military Road and the Whitstable group at St Mary’s Hall on Friday, 8 January at 5.30pm.“. -John Rose.